Our shyam sundar is full of beauty and grace. The blue complexioned lord is the abode of countless divine attributes and he brings unlimited joy to the rasiks. 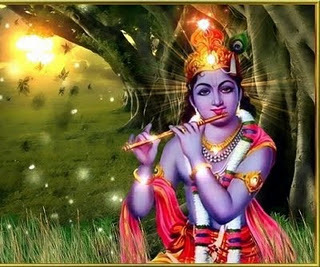 He plays the flute while grazing the cows and he is very dear to the gopis. The peacock-feathered crown is swaying in his head and his curly ringlets of hair are kissing his all attractive face. His yellow silky upper garment is fluttering on his shoulders and the cowherd’s stuff wound up in it is looking very beautiful. The bracelet in his hands, the delicate chains around his waist and the anklets around his ankles is jingling and tinkling and making a very sweet sound. Shree Kripaluji says when shyam sundar casts side-long glances the one on the receiving end is finished forever.